As is the remit of Financial Regulation Matters, it should not be surprising that analysing financial regulators is of key concern for this blog. In doing that, however, we get to see the diverging experiences of a financial regulator, and how differing approaches yield very different results. We have examined a number of regulators throughout the years in this blog, and two have factored heavily in our analyses. Today, we revisit the two particular stories which have evolved recently and left the respective regulators facing a number of criticisms. We examined the case of the Serious Fraud Office (SFO) launching proceedings against three Tesco Executives back in February. Then we discussed how the SFO were alleging that fraud by abuse of position, and false accounting were the crimes of Carl Rogberg, John Scouler, and Christopher Bush. That post asked whether the SFO would continue in their pursuit, and shortly afterwards it was confirmed that they would be. For the past two months the trial against Scouler and Bush had been ongoing until this week when, at the behest of Sir John Royce, the trial was dismissed on account of the Court of Appeal agreeing with Sir Royce that there was no case to answer. Whereas a regulator cannot be expected to succeed in every regulatory action it takes, the views of Sir Royce were scathing: ‘I conclude in certain areas – one in particular – the prosecution case was so weak it should not be left for a Jury’s consideration’. According to Sir Royce, the major weakness was of the failure to prove knowledge on the part of the defendants, whom he said were of ‘impeccable character’. The Financial Times reports that the SFO are now considering whether to push ahead with their prosecution of the remaining defendant Carl Rogberg. The SFO is a regulator that is constantly in the political crosshairs, and this failure, when conjoined with their recent failure to bring charges against Barclays over their Qatar-based financial crisis-era funding, is a particularly dreadful start for the new head of the SFO, Lisa Osofsky. However, the failures raise a number of important issues that are worth addressing. Those issues revolve around the standard of proof required for prosecution, which is central to the failure of the Tesco case. Osofsky herself noted this year that the current standard of identifying a ‘controlling mind’ when prosecuting was too high of a standard in relation to corporate forms. Instead, she argued that an introduction of the concept of a ‘failure to prevent’ would be more suitable i.e. a person or company being held to account if it could not prove that it [they] had not done enough to prevent a crime. Here, then, is where it becomes very difficult to foresee any meaningful change, and it is questionable whether that change should occur. If the three executives are guilty, then the need to identify a controlling mind is fundamentally in the favour of the corporate form, which can protect individuals (despite of the measures available to ‘lift the corporate veil’). If the three are guilty, then the £10 million spent by the SFO will have been nowhere near enough to obtain information that surpasses such a high burden of proof. However, if the opposing model was adopted, and a failure to prevent model was in place, then there is the likelihood that three people who boast clean track records would have been indicted. It is difficult to foresee any change in this arena anyway, as we currently reside in an incredibly pro-business environment that will naturally require only the very highest standard of proof in order to prosecute corporate individuals. For the SFO, the issue remains that whilst their successes are notable (their DPA prosecution of Rolls Royce for corruption and fraud stands out), their failures are mounting and are incredibly visible. Osofsky has a decision to make as to what form the SFO adopts on her watch, as her predecessor’s approach garnered results but ultimately could not save the regulator from sitting directly within the political crosshairs of the Conservative Party. The future of the SFO will likely be dictated by her decision in the coming months. This perhaps just serves as an update, as RBS and the FCA’s handling of this troublesome bank have occupied a number of posts here in Financial Regulation Matters. We know that RBS came in for incredible criticism regarding the actions of their ‘GRG’ unit which was established to ‘assist’ SMEs – with a number of SMEs failing under their watch. We have examined this case from its inception, and discussed how the FCA initially held back a damning report before the Treasury Select Committee, alongside a number of leaks, forced the report into the open. Yet, there has been a development recently that brings this issue sharply back into the spotlight. A former Executive of a company that failed under the GRG unit has applied for a judicial review of the FCA and its decision to drop an investigation into the GRG unit, which at the time saw the regulator declare that its options were ‘limited’. As part of the application, Neil Mitchell, claims that the FCA has been ‘unlawfully refusing or failing’ to fulfil its obligations as the chief financial regulator, and that as a result of this the decision to terminate the investigation should be changed. The FCA’s response was that the GRG, as an area of finance, ‘was largely unregulated and the FCA’s powers to take action in such circumstances, even were the mistreatment of customers has been identified and accepted, are very limited’. Yet, Mitchell is asserting that the FCA does have a role to play, mostly in terms of ruling whether former GRG managers were ‘fit and proper persons’, and whether the controls and systems within GRG were adequate. It will be interesting to see what the decision is for this particular application. Mitchell is related to the group that recently won a settlement from RBS, rumoured to be around £200 million, and as such demonstrates the understanding that a settlement was always unlikely to be the end of the matter. Whilst it is difficult to predict the outcome of the application, a successful outcome will likely spell trouble for Andrew Bailey, the current Head of the FCA. It has already been stated in the business media that ‘Andrew Bailey must pay the price for FCA failures’, and if this application is successful then those calls will grow even louder. 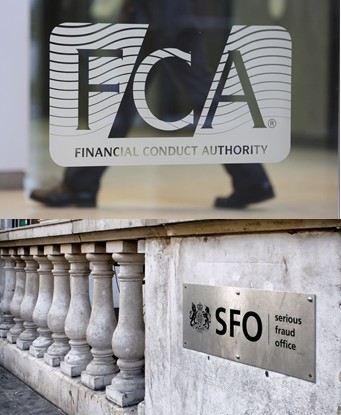 If the Review then finds that the FCA did have options available to them, the obvious of question will be ‘why were they not used?’ Potentially, and unfortunately for Bailey, if that question is officially asked there cannot be many other responses than a captured, or at least subservient regulator when it comes to the very elite in the business world. We have discussed before the national importance of RBS and its ‘too big to fail’ characteristic, and regrettably regulatory capture often forms part of that dynamic. This judicial review application could have massive consequences for the regulatory framework in the UK, just as it is tasked with regulating a marketplace that is entering particularly volatile waters. Interserve on the Ropes, or a Model on the Ropes?